Acouple suspected to be serial kidnappers of international dimension has been nabbed by the men of Lagos State Police command. Mr. Nwangwu Emmanuel and his wife Beatricial Nwangwu were arrested recently by the operatives of the State Anti-Robbery Squad(SARS) after a long search. The suspected evil couple according to police source, were arrested in Abuja where the husband was working as a driver to a retired military officer. Before their arrest, the couple had thrown several families into trauma, pains and tears by kidnapping their children and carried them across the border to Ghana where they demanded and received ransoms in millions of naira. 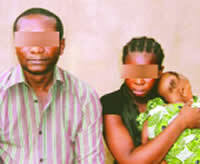 Before the police made what was been described as a major breakthrough in the quest to unravel the mystery behind several incidents of unreported cases of kidnapping in the state, the couple had earlier been declared wanted by the Interpol, Force CID, Abuja, Lagos State command, SARS, Zone 2 and Lagos. Speaking on the arrest, the Lagos State Commissioner of Police, Umar Manko who described the couple as notorious noted that most of their victims were children of the families where the wife had served as housemaid. CP Manko said some policemen in Ghana were dismissed from their job because they collected some illegal money from the couple. The police in Ghana later declared the couple wanted for using their country as a country of collecting ransom from victims of the kidnappers. Manko added that it was a female DPO who got the number of the suspects and that it was after that, that he tasked the SARS to go to Abuja and arrest the suspects . The husband told his story to Crimewatch “I am from Enugu State and I grew up in Ghana where I stayed for ten years. In 2008, I was employed by Mrs Folake Coker in Ikoyi Lagos and I was being paid the monthly salary of N25,000. One day I deceived one of the house maids to buy something for me pretending to be sick. Then I used the opportunity to kidnap the 2years old daughter of my boss. quickly took a cab to Mile 2 before taking a drop to Ghana. “ I later called my boss and she recognized my voice. I demanded a ransom of N22million. The money was paid to my bank account in Ghana. I dropped the daughter in one hotel in Ghana and told them to pick her up there. I used the money to buy cars which I was selling in Ghana. Nwangwu explained that in 2009 his wife was employed as housemaid to Mr Alfred Edozie and that after just one month, the wife kidnapped one of her boss’s daughter. “My wife just called me one day that I should bring a taxi to the estate that she has kidnapped one of the daughters of her boss. Immediately we took the daughter and passed through Mile 2 and took a drop to Ghana. We called the family of the girls and we made a demand of N15million as ransom, but they paid N12M to my wife’s bank account in Ghana. We didn’t know that the Interpol were already monitoring us. “When we went to withdraw the money the bank manager first paid her N6m and told her to come back the following day for the remaining ones. The Interpol officials from Ghana cornered my wife and told her that the Nigerian police would soon arrest her. My wife gave the police officer N6m and he took my wife to an hotel in Ghana and later told us to escape. The bank in Ghana closed our account ., That was how we lost the N12m in Ghana,” he said. Also speaking, the second suspect, his wife said it was easy for her to kidnap because she pretended to be a housemaid and when she is employed after some days or weeks she will kidnap the kids of her employer..
CP Manko said the investigation is still ongoing in the matter and that when it is concluded they will be taken to court. READ Girl Found Dead In A Pond! Previous article dbanj And Kanye West Star In New Movie! Next article BREAKING NEWS: Bomb Blast At Port Harcourt Park. dbanj And Kanye West Star In New Movie!